Prove me wrong, internet: There are no famous female cereal mascots. Okay, well, first let me prove myself wrong a bit. It’s pretty common for female characters to appear on cereal boxes after they’ve become famous in some other medium. (And yes, I’m calling cereal boxes their own medium. It’s defensible, if you mentally squint.) Hello Kitty, Jasmine from Aladdin, Dora the Explorer, Rainbow Brite, the Powerpuff Girls, Strawberry Shortcake and even Shortcake’s friend have scored their own box covers. But I’m talking about female counterparts to Tony the Tiger, Cap’n Crunch, the Lucky Charms leprechaun, the Trix rabbit and other characters who started out on as cereal-promoting characters and are now recognized, familiar entities. There aren’t any, really. This shouldn’t be surprising, since the kinds of cereals that feature cartoon mascots are marketed to children, and half of this demographic wouldn’t want to eat girly cereal. Girls, on the other hand, are expected to be okay eating cereal endorsed by a male character, but none of the famous cereal mascots act in a particularly masculine way. (Even open-minded girls might object to eating, like, Army Men Cereal or Chuck Liddell’s Breakfast Beat-Downs, however.) But because we live at a time when we’re offered nine different varieties of Frosted Mini-Wheats, it doesn’t seem implausible that at least one cereal brand would have successfully launched a girl-targeted cereal with an original, female mascot by now. It also shouldn’t be surprising that someone has set up a database of cereal mascots. I scrolled through it to see if there was a notable she-mascot that I just hadn’t thought of. Nope. But for the sake of your edification, I’m giving you what comes closest to fitting the bill. In 1996, Quaker tried to market its Cocoa Blast cereal with a flying cow either named Kamicowzi or Komicowzi. The mascot gallery uses both spellings, and there’s next to nothing about this character online, presumably because like real kamikaze pilots she was short-lived. I say that’s a good thing; sugary cocoa or not, it’s in pretty bad taste to use a kamikaze pilot as a basis for marketing any product, much one that has the word blast in its name. 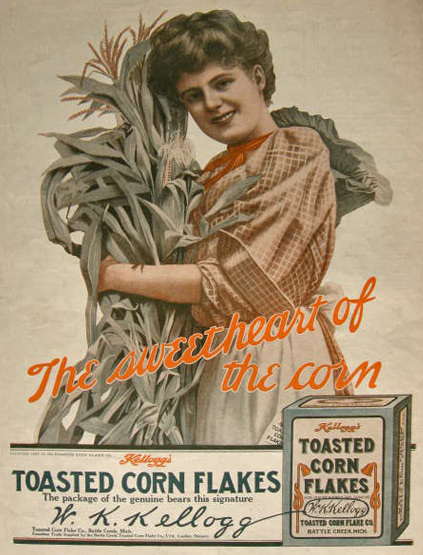 Between 1907 and the 1920s and again between 1940 and 1946, Kellog’s used The Sweetheart of the Corn on the front of cornflake boxes. She sort of looks like a shopping buddy for the Sun-Maid Raisin Girl — that is, she’s cute (in that “My girl really knows how to churn butter,” turn-of-the-century way) and more realistic-looking than cartoonish. At various points a baby doll version of the character was offered, so it seems like Kellogg’s had little girls (and weird middle-aged men) in mind when marketing Corn Flakes. Honorable mentions: When I tweeted that there were no female cereal box mascots, Vovat responded that Waffle Crisp’s TV ads featured kindly grannies — the “inventors” of the cereal. So it’s something, at least, that they were the closest the cereal had to mascots and that they did not exist alongside a more central, male counterpart. In conclusion: As if women don’t struggle enough with the glass ceiling, there’s also apparently a cardboard wall holding them back. Note: With the posting of this, I have fulfilled my contractual obligation to write something cereal-related for this blog at least once a year. I'm not sure if there are any "famous" female cereal characters. Freakies cereal had male and female freakies on the box, and Frosted Flakes had Katy the Kangaroo for a little bit, but I can't think of any worth their weight in cereal. I would so eat Chuck Liddell’s Breakfast Beat-Downs.